We currently stock two wood chippers. Pictured above is our Vermeer Chipper which is capable of handling small to medium size brush. This machine is ideal for 3- 6" brush which has been freshly cut. It cannot handle single pieces of wood over 6" or pieces that have been sitting for more than a month. The large chipper is a tow behind unit and requires vehicles with a tow hitch rated for 3500lbs. 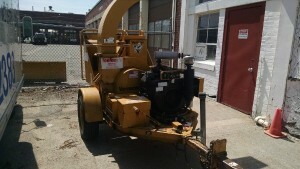 This machine can be hooked up with either a two inch ball or pintle hitch. Please let us know in advance what type of hitch you have so we can change the setup on the chipper in advance. Due to local regulations surrounding the Asian Longhorn Beetle Epidemic Toomey's recommends checking with local officials before booking this machine. In most cases this machine is suitable for chipping on site but not for chipping and then transporting chips. If this chipper is too large for your job we also carry a smaller tow behind chipper which will handle stocky brush from 1/2 an inch up to two inches. This brush must also be freshly cut. To transport the smaller chipper customers will also need a vehicle with a 2" ball. This item must be towed. Please call us for more information.